Ethnobotany is the study of cultural plant use and perception of plants. Indigenous Australians have used plants for food, medicine, tools, utensils, weapons, etc. for thousands of years. However, since the arrival of Europeans, a lot of traditional plant use knowledge has been lost. 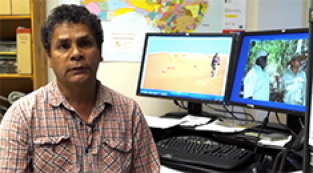 One principal aim of the Tropical Indigenous Ethnobotanical Centre (TIEC) is to record, document and research cultural plant use knowledge, which could be of mutual benefit to traditional Owners and their partners. The TIEC was developed in partnership between the Australian Tropical Herbarium, Traditional Owners, the Department of Science, Information Technology, Innovation and the Arts (DSITIA), CSIRO and the Cairns Institute. The TIEC aims to empower Indigenous people to renew and strengthen their cultural knowledge and practices about plants. Many Traditional Owners believe that keeping their knowledge alive and passing it on to the next generation is very important. The TIEC will support Traditional Owner information sharing, practice and collaboration, and also support keeping plant collections and data for Traditional Owners through shared protocols and agreements. The development of the Tropical Indigenous Ethnobotany Centre is being led by ethnobotanist Mr Gerry Turpin (DSITIA/ATH), an Mbabaram elder.